The film follows Casey Newton (Britt Robertson) and Frank Walker (George Clooney) who cross paths when they realize they have been to the same mysterious place when touching a certain pin button known as Tomorrowland. We see that Frank was there as a child, but is now a crotchety old man who is more bitter than sour milk, where a teenage Casey is as optimistic as they come. This place called Tomorrowland is a magical place not in this visual place where the brightest and smartest people have come together to make the world and human race a better place. Basically, it’s pure euphoria, which is actually what Walt Disney and his fellow co-workers did in creating Epcot, which was to showcase the best inventions for a better tomorrow. But something went wrong somewhere, as Frank knows exactly when the world will end. 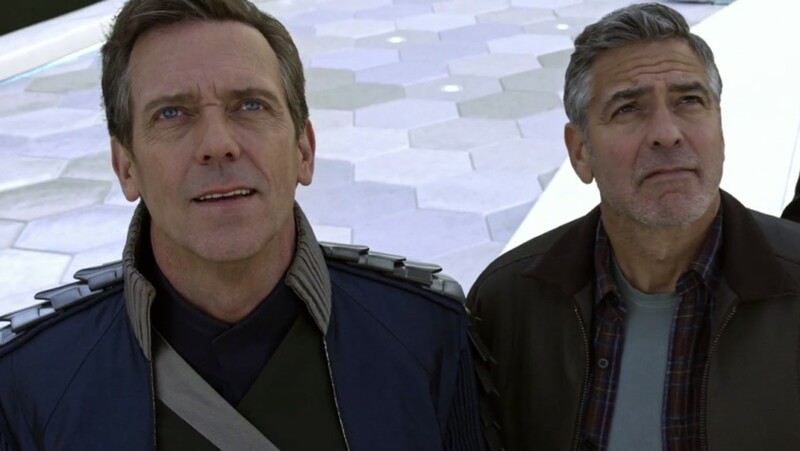 Casey and him, along with a young special girl named Athena (Raffey Cassidy) set out to get back to ‘Tomorrowland‘ to confront the person in charge (Hugh Laurie) in order to reverse the destruction of the world. 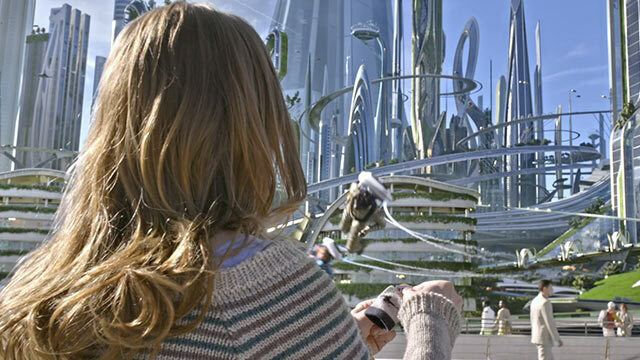 With all of the dazzling effects, robots, futuristic landscapes and inventions, and jet packs, ‘Tomorrowland’ looks incredible on every level. The amount of imagination and detail that went into every prop and invention is stunning, and made my eyes widen with wonder, just like when I was a kid watching sci-fi films for the first time. However, there were downfalls with this movie too, one being that it dragged on a bit too long with the script really going overboard with political and social views. It happened more than once and they literally hammered it all the way in, detailing what they thought. It was completely out of place and took out the magic of the film in these moments. Another little annoying quality was that the story was somewhat narrated by Frank and Casey, which would be fine, but there was a running joke where the young teenager would always interrupt the old guy when he was narrating. It became tedious and unfunny after the second time it happened. Despite a few script issues and pacing problems, ‘Tomorrowland‘ still packs enough adventure and amazement to satisfy the summer movie blockbuster crowd. There is a great scene set in a comic book and toy store that brought memories back to me that starred Keegan Michael Key and Kathryn Hahn as the store owners, complete with all the ‘Star Wars‘ figures you could want. It had me rolling. 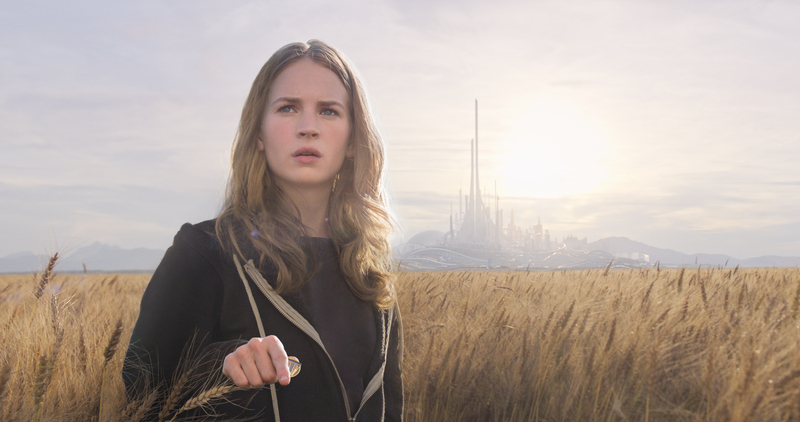 ‘Tomorrowland‘ isn’t the Disney movie we hoped for, and several plot points are there one minute and gone the next, including a very ‘Matrix‘ like villain similar to Agent Smith. That all being said, there are enough positive things here to keep adults and kids entertained, but don’t expect them to purchase any of the toys. This entry was posted on Thursday, May 21st, 2015 at 1:40 pm	and is filed under Film, News. You can follow any responses to this entry through the RSS 2.0 feed. You can skip to the end and leave a response. Pinging is currently not allowed. « Film Review: ‘The Human Centipede 3: Final Sequence’! !